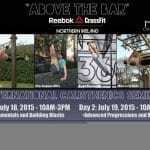 Recession Proof Body will be returning to RCFNI on 18th & 19th July for their ‘Above the Bar’ International Calisthenics Seminar and Workshop. The Fundamentals and Building Blocks Seminar will involve two training sessions with a lunch break in between. In the morning session participants will learn the correct approach to the basic body-weight movements (push ups, pull ups, dips) as well as a number of their variations. With each move participants will explore different ways of training with them as well as gaining strength and power through them. Challenging solo/group exercises will wrap up each instructional segment. Recession Proof Body & MR Calisthenics are known for their elite freestyle form of body-weight training and now you can learn how to train just like the guys! The Advanced Progressions & Routines Seminar will be broken into three sections: Techniques/Progressions/Variations, Real Park Experience, and Freestyle. There will also be a lunch break prior to the Real Park Experience. With the Techniques/Progressions/Variations section participants will be given step by step instruction on how to correctly perform elite body-weight techniques such as the Front and Back Lever, Freestanding Handstand Push Ups, Handstands, Human Flag, Planche, One Arm Pull Ups and more! In addition, a number of progressions used to achieve and strengthen these moves will be taught. We recommend that you sign up for both Saturday and Sunday where possible, there is plenty to gain from both, from learning the progressions on the Sunday to learning variations of basic exercises that you most likely haven’t come across before on the Saturday. Both Seminars as with every “Above The Bar’ Seminar will be coached in a relaxed and encouraging environment by some of the most highly respected and established body-weight trainers in the business.